They say timing is everything and when it comes to social, the old adage isn’t too far off. Now more than ever it’s important that social messages are shared at the right time, to the appropriate audience and on the proper social network. While it can vary by social platform, optimizing timing of posts by comprehending your followers’ needs and behaviors is a significant piece of a successful social strategy. Reaching more customers with the content they want to see and pursuing leads using social media is a great way for businesses to boost revenue and sales. Our team uses Sprout’s publishing toolset to schedule, target and distribute social content. Within Compose, the social team can target posts based on geolocation and audience demographic. Paired with Sprout’s Scheduler, this functionality enables messages to be queued and published down to the exact minute. This feature set is particularly useful for the distribution of our Latin American content. 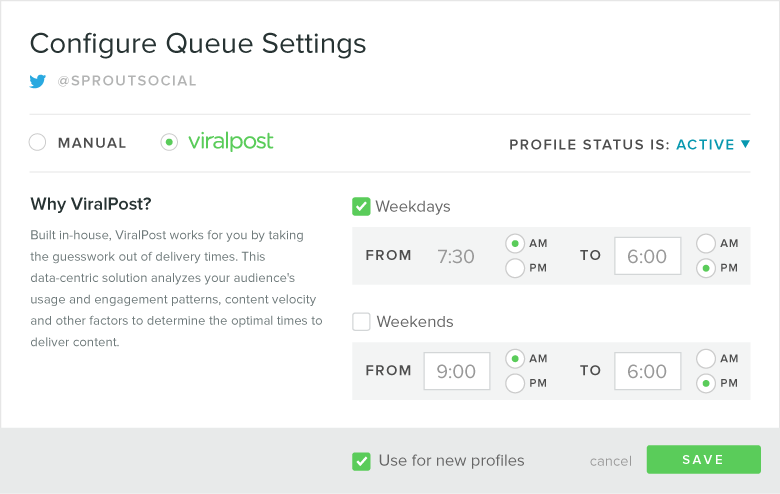 Unlike other social media scheduling tools that simply monitor posted content trends, ViralPost® identifies times when your actual audience is actively engaging with content. This ensures the greatest probable impact by suggesting distribution times that correlate with when fans and followers are commenting, liking and sharing. Being able to schedule content and knowing it will be disseminated at the optimal time offers a broader opportunity to take advantage of those unplanned moments, when real-time content comes into play. Our publishing strategy is focused on organization and optimization in a landscape that’s evolving every minute. It’s also heavily informed by our platform’s reporting capabilities. The Facebook Pages Report, Twitter Profiles Report and LinkedIn Company Pages Report are used to benchmark success. Moreover, the Sent Messages Report empowers our Social Media Specialist with the tools she needs to analyze an individual post and identify what components might have contributed to its amplified reach. Collectively, this insight helps us understand what content resonates across networks—so we can make more of it—and improves our publishing strategy accordingly.